The Festal Works of St. Gregory of Narek, Annotated Translation of the Odes, Litanies, and Encomia, a book presentation by Dr. Abraham Terian will take place on Monday, February 27, 2017, at the Armenian Museum of Fresno Exhibition Hall. Monday, is also the first day of Great Lent in the Apostolic / Orthodox Churches, and for the Armenian Evangelical Churches. The Roman Catholic Church commemorates on this date Saint Gregory of Narek, who is most known for his prayerbook titled, Book of Lamentations. Terian’s is the first translation in any language of the surviving corpus of the festal works of St. Gregory of Narek, a tenth-century Armenian mystic theologian and poet par excellence (d. 1003). Composed as liturgical works for the various Dominical and related feasts, these poetic writings are literary masterpieces in both lyrical verse and narrative. Unlike Gregory’s better-known penitential prayers, these show a jubilant author in a celebratory mood. 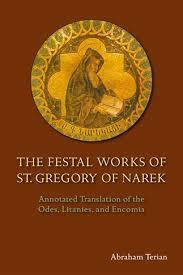 In this volume Abraham Terian, an eminent scholar of medieval Armenian literature, provides the nonspecialist reader with an illuminating translation of St. Gregory of Narek’s festal works. Introducing each composition with an explanatory note, Terian places the works under consideration in their author’s thought-world and in their tenth-century landscape. Liturgical Press, Collegeville, MN, 2016.